Get 3 FREE Gifts just for stopping by. Thanks!! H Cortez is an author, wealth strategist and serial entrepreneur and founder of the Black Wealth Movement. The Black Wealth Movement is a network of individuals committed to bring economic empowerment to the black community. We teach 6 fundamental wealth building principles. ENTREPRENEURSHIP - America is business and if you don't have a business in America you may as well be a foreigner in your own country. We teach the true power of entrepreneurship and why every wealth building portfolio should have a private equity business, in particular a home-based business, especially in the early stages of ones wealth building journey. TAX MINIMIZATION - If you're like most Americans you're earning 100% of your income through labor and because of the way you choose to earn income, by default you've chosen to pay the most in taxes. We teach legal and ethical tax minimization strategies that anyone can apply to reduce their tax liability. DEBT ELIMINATION - It's EXTREMELY difficult to build wealth when you're drowning in debt. Most working Americans are living paycheck to paycheck therefore they only make enough money to service their debt, but never pay down the principle. Well if you learn to reduce your tax liability, those savings can be used to apply to debt. CREDIT EDUCATION - You've probably heard it said that "Cash is King" and that is true, but CREDIT rules the kingdom. In the black community we only know to make money with labor so Uncle Sam gets 1/3 of our income. Because of bad credit the banks are getting another 1/3 or our income due to high interest rates. So we have to teach our people how to get good credit, maintain good credit and how to leverage credit to build wealth instead of leveraging it to but JUNK! ASSET ACCUMULATION - It's widely know that black people in America are the worlds biggest consumers. We have the lowest median income and yet account for as much as 80% of all retail spending. In other words we consume our wealth while making other nations wealthy. We have to teach the importance of asset accumulation and how to buy assets and pass them down to our children so that each generation is NOT starting from zero! LIFE INSURANCE - This one is touchy for many black people. Traditionally we never want to talk about the thought of dying, let alone actually prepare for it. Life insurance not only creates a much needed wealth transfer in the black community but it's much more than that. How about Accident and Disability insurance that protects ones income, whole life policies that build cash value that could be borrowed against if needed. If you don't have life insures to provide a financial safeguard for your family in the event of an untimely death, you my friend are selfish. ​Learn more about the Black Wealth Movement by Clicking Here! Building wealth is simple but it's not easy, however when you have the right information, a good strategy and a team to hold you accountable it does become "EASIER!" So be sure to enter your details above so that we stay connected. I'm not an email freak so you won't get tons of emails from me. I will definitely be reaching out though from time to time with wealth building tips and strategies that can help you on your wealth building journey. If you'd like to support me in my efforts to bring Financial Literacy to the Black Community you can do so in a few different ways. You can purchase either of my books bundles and coaching program click here! Grab your copy of these books today both come with extras. 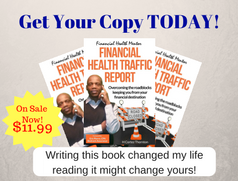 If you grab the print copy of Financial Health Traffic Report you'll get a FREE 15 minute consultation with the Financial Health Mentor himself. Get tips on improving your finances and more. 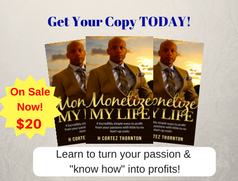 Grab your copy of Monetize My Life and get a FREE 1 month subscription to www.monetizemylifeacademy.com a $97 value. Learn the skills you need to transform your passion and "know how" into income. To redeem your extras simply email your proof of purchase to hcortez@financialhealthmentor.com with FREE EXTRA in the subject line. I know these books will bless your life but only if you take the appropriate action.